Here’s a good choice for a summer vacation…..
For four hours with friends and family, it’s the perfect way to bond. If you want your mind nervous and your heart pumping 170 beats per 60 seconds, traverse through its winding, rough waters. Searching for an experience this April and May that you won’t forget in 25 years? 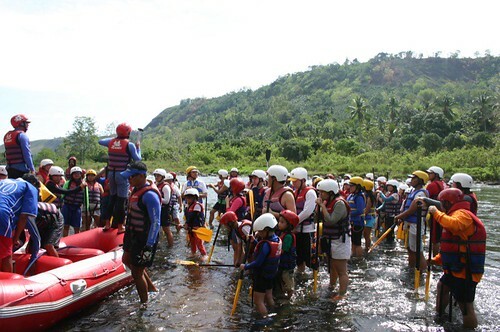 Hop on that inflatable raft, paddle, and ride this roller-coaster that’s named the most popular tourist attraction in Cagayan De Oro City. 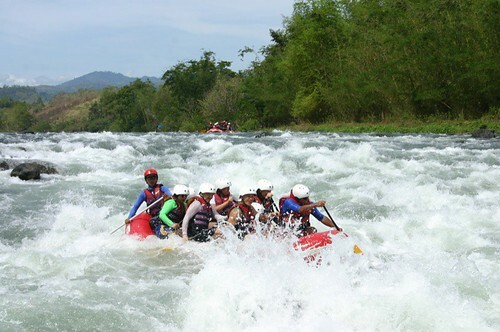 White-Water Rafting, it’s called and, among our 7,107 islands, the best spot to try this adventure is in CDO. From Cebu, you take the 8 p.m. boat, close your eyes and, when you awake at 5 a.m., you’ve docked. Or, with Cebu Pacific offering P88 flights, that’s an even quicker way to land in one of Mindanao’s most progressive cities. Two years ago, with J and J—my wife Jasmin and daughter Jana—we jumped on this excursion. It was the 27th national anniversary of our group, the Brotherhood of Christian Businessmen and Professionals (BCBP), and, very timely, the venue was CDO. Thousands from all over our archipelago converged in Cagayan; we held our BCBP gatherings at the giant Lim Ket Kai convention hall for two days and, when Sunday arrived, it was our free day…. time to get wet! That morning we arose at six. We boarded a jeepney, rode for 30 minutes then reached the starting point by 8 a.m. With us in that morning trek from BCBP Cebu were Loloy and Alice Atega, Dr. Hoppy Sto. 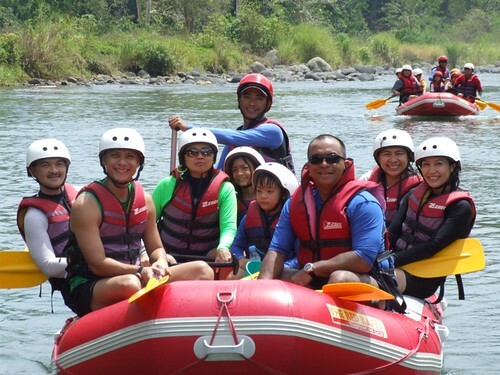 Domingo, and, from our group that would ride the same raft, eight close friends: Jourdan and Jingle Polotan, Dr. Ronnie Medalle, his wife Stephanie and their son, Santi; me, Jasmin and Jana. Upon arrival, we slipped on our life-vests, donned the helmets then headed to the shallow water to listen to a 10-minute orientation. Lava rocks? That’s unusual, I told myself. Next, we were taught the various ways to paddle. Then, in a serious tone, he said, “And you know the best way to paddle? It’s called the ‘S’ paddle.” He then drew an ‘S’ in the water then splashed all of us! Everyone joined in wetting each other as another round of laughs ensued. 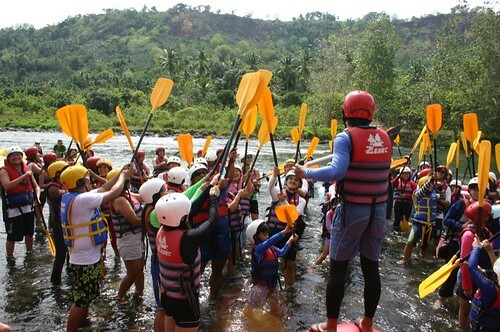 In unison and to practice, we all raised our paddles and shouted…. AHOOOOO! Jourdan Polotan sat at the front. A leftie with biceps like Hulk Hogan’s, Jourdan sat at the left. Right-handed, I sat on the right. Perfect. We could paddle using our dominant arms. On the second row were Ronnie and Steph; third row sat Jingle and Jasmin. The two children with us? 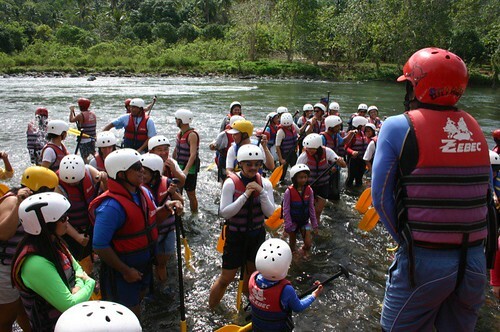 My daughter Jana and Ronnie’s six-year-old son, Santi, sat in the middle of the raft. We were all set and awaited the other rafts to go ahead. Scared? Anxious? Intimidated? Yes. Unlike Jourdan and Jingle who experienced this in Indonesia and Ronnie (who was on his fourth try)—this was a first for me and Jasmin. Plus, we brought along Jana—all of eight years old. 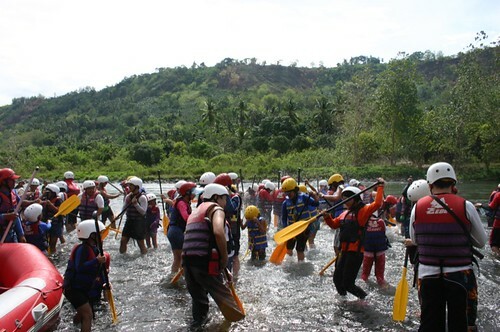 Tried tubing in the CdO River in 2005. We used tubes and didn’t have paddles. We used the weight of our bodies to direct our course while shooting the rapids. In my next visit to the river, I tried the body board. It was a crazy but great adventure. Did you try jumping from the bridge into the river? 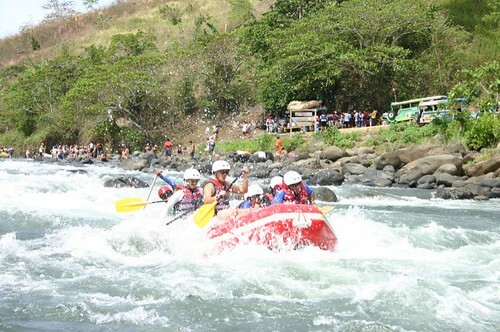 What about jumping from what the river guys call the carabao rock into the swirling water? I did both with Chuck Norris and Sly Stallone in my thoughts. MPS: Yes, heard so much about Sagada. Will surely go there soon! Haven’t tried the tubing but heard that it’s a lot of fun… I guess scarier, right? Great pics, I wish I could try that soon. Whoa even Santi(cousin) came along. what perfect timing! we will be in cdo by may 3 and thanks to your article, i was able to contact the group through the website you mentioned. muchos gracias senor pages! oh and the whole tour now cost php1100/head, still reasonable i reckon. Nice photos 🙂 gusto ko din matry yan . Wow, I must try water rafting right now. At first, I’m thinking that it is too much risky and nervous but as I read this blog, I know it’s a fun and a worthy experience. I will convinced my friends to do this one next week. Thank you.